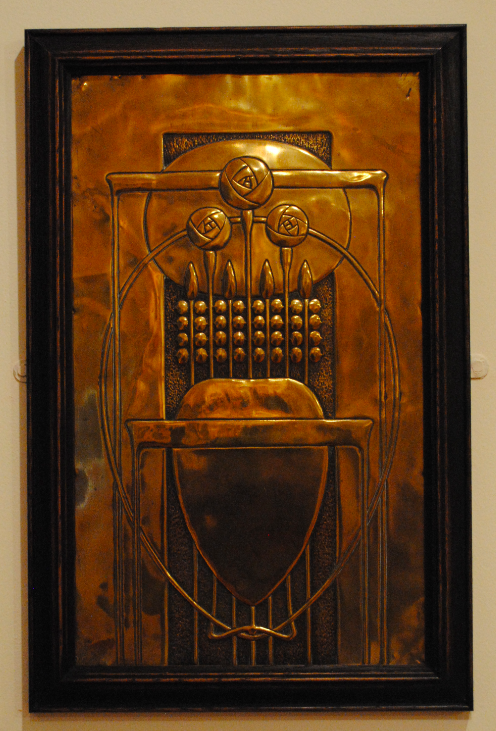 On display as part of the Glasgow Style: Arts & Crafts from 1890-1930 Exhibition held at Blackwell Arts & Craft House, was the above brass and wood framed panel. Dating to circa 1900, the panel is the work of the English designer Talwin Morris. Born in 1865, Talwin was a revolutionary designer of the Arts & Crafts Movement. A prolific designer of book covers for the Glasgow based publishing house Blackie & Son, Talwin was part of the distinctive style of art which became known as the Glasgow Style. Influenced by European Art Nouveau and images of the Celtic Revival, Talwin helped to create the Glasgow Rose motif which features in the panel above.